The Canadian housing market is popping their is already a bailout to save a mortgage company. Initial jobless claims inch up. Consumers are tapped out, credit defaults on the rise. Pending home sales decline and they have been flat-line for years. Durable goods decline. GDP is estimate has now dropped to .2%, this is terrible. Trump flips on NAFTA, he is now going to negotiate it first, if it does not work then he will make the move to remove it. Trump says the Government my shutdown. The Government has shutdown in the past and the people didn’t even notice. Bernanke says not to worry. Everyone should be worried now. Duterte is now getting rid if the Rothschild banking system. Trump trying another round of health care. Ivanka talks about refugees coming into America. US drops in press freedom. North Korea allegedly puts out another propaganda film, starting to look a lot like the IS videos. Putin says we need to calm the situation down. Trumps meeting with Senators ends up to be a discussion of peace, not war. US fires a flare at an Iranian patrol boat. Turkey sells weapons to the IS. Wednesday. Home Capital shares dropped by 61% in Toronto to the lowest since 2003, dragging down other home lenders. The last two weeks have seen initial jobless claims rise 23k to 257k. This is the biggest 2-week rise since Thanksgiving last year and is back above the Trump election levels and the start of 2017 levels. Two weeks ago, when JPMorgan launched Q1 earnings season, we noted that while the results were generally good, one red flag emerged: the company’s credit card charge offs rose to just shy of $1 billion, the highest in four years. According to the latest data from the S&P/Experian Bankcard Default Index, as of March 2017, the default rate on US credit cards had jumped to 3.31%, an increase of 13% from a year ago, and the highest default rate since June 2013. The National bank card default rate of 3.31% in March sets a 45-month high. When comparing the bank card default rate among the four census divisions, the bank card default rate in the South is considerably higher than the other three census divisions. Upon further analysis to the South’s three census regions, East South Central – comprised of Kentucky, Tennessee, Alabama, and Mississippi – has the highest bank card default rate. over the last year three of the four major types of loans began experiencing a deterioration in loan performance. Contracts to buy previously owned U.S. homes declined in March after rising a month earlier by the most since 2010, t pending home sales have been stagnant for almost two years. core durable goods orders dropped 0.2% in March – the biggest drop since June 2016. Once again it seems ‘hard’ data is not supporting the exuberant ‘soft’ data. March saw inventories drop 0.1% (against expectations of a 0.2% rise). This is the first quarterly decline in wholesale inventories since Q1 2016 (when the world was feared to be heading into recession). Yet another ‘hard’ data disappointment. Some more context: if the Atlanta Fed is right, and tomorrow the BEA confirms that GDP was around 0.2% , this will be the lowest GDP quarter in which the Fed has hiked rates since Q4 1980. So what if Trump just pulls America out of NAFTA unilaterally? It sounds like he could do it. NAFTA’s Article 2205 presumably allows the president to pull the U.S. out of the trade deal without any input from Congress. All he has to do is provide six-months written notice. No one’s ever actually tried this before, though. America hasn’t walked away from a commercial treaty since 1866. And it’s an open legal question whether the executive branch can really just unilaterally withdraw from a treaty. So the White House could get sued right out of the gate by any number of businesses who rely on trade across the North American continent. Congress also passed a number of laws to put NAFTA’s terms into effect. Those would remain regardless of NAFTA’s fate, and would have to be scrapped by the normal legislative process. Democrats aren’t looking for a ‘deal’ on a funding bill… they actually want a government shutdown. So what does a “government shutdown” look like? Do the president and vice president resign now that the government ends? No, they stay on the job and receive full pay as before. Does Congress fly out of Washington D. C. the following day and cease to draw their pay, and the Supreme Court cease to deliberate on constitutional questions? Does the army come home and cease to protect us? No! No, NO! Do states, counties, and cities no longer function? No again, they have their own tax base and policemen, prisons, and teachers remain in place. Will we still get mail? Yes. The U.S. Postal Service functions as an independent business unit. Will we still get Social Security benefits, food stamps, unemployment compensation and veterans’ benefits? Yes! we have had 18 “government shutdowns” since 1977 according to the Congressional Research Service, the Reagan Administration having 8 of them alone. Because in 1979 the government was shut down for 10 days while Congress argued over a proposed salary increase for the legislative branch. Because we had a five-day shutdown between November 14 and November 19, 1995, and a second one of 21 days, between December 16, and January 6, 1996, and none of the bad things mentioned above happened. No! Not even one. In fact, the public as a whole didn’t even notice it. Essentially all went on as before except some paychecks were a few days late. So at worst a “government shutdown” is really only a partial shutdown of non-essential services and a delay of payment for some few federal workers. According to the Fed Model for valuing assets, stock prices trade based on interest rates (bond yields). (Stock Earnings/ Stock Prices)= 10 Year Treasury Yields. So… if yields are pushed to record lows courtesy of Fed policy… and earnings are not growing rapidly to make up the difference, stock prices must soar. If this sounds like a load of nonsense to you, it is in fact the primary argument the financial elites are making for why stocks are such a bargain even today. the feds game: drive yields down so that stocks will rally. Indeed,this was the entire point of Fed activity post-2008: to reflate another bubble (this time in bonds) forcing capital into the financial markets. So in this sense, stocks are in fact in a derivative bubble… a bubble that is derived from another bubble (this one in bonds). And it will end as all bubbles do: in disaster. he says he will “eradicate all traces of Rothschild financial criminality” from his country, there is no question he will follow through, despite the inherent risks. The MacArthur amendment will grant states the ability to repeal cost driving aspects of Obamacare left in place under the original AHCA. While the revised version still does not fully repeal Obamacare, we are prepared to support it to keep our promise to the American people to lower healthcare costs. We look forward to working with our Senate colleagues to improve the bill. Reporters without Borders just published its annual World Press Freedom Index rankings, and the results for both the U.S. and UK are not impressive. Both countries declined two spots from last year, with the UK at 41, and the greatest and most free nation on earth, America, down to 43. North Korea Releases Video Simulating War With The U.S. The video was released just days after North Korea conducted large-scale artillery drills, showing off conventional weaponry that can easily reach South Korea’s capital, Seoul. It also comes one day after the entire Senate was gathered at the White House to receive a briefing from Trump’s top generals on the situation in North Korea. After weeks of threats of unilateral military action, joint statement by US Secretary of State Tillerson and US Defense Mattis appears to call that option off . t produced precisely nothing and which lasted all of 14 minutes – of trying to stop the North Korean nuclear weapons programme through “sanctions and diplomatic pressure”. The United States seeks stability and the peaceful denuclearization of the Korean peninsula. We remain open to negotiations towards that goal. Russia has adapted to the situation and its economy started to grow in 2017, Jazairy said, adding that if the anti-Russia sanctions remained in force they would not have any dramatic effect. US warships have made a habit of wandering around in the Persian Gulf just off the coast of Iran, waiting for Iranian Naval ships to get sort of close, then complain in the international media how “unprofessional” that was. Today, the USS Mahan took it a step farther, firing a “warning flare” at the Iranian ship. Officials didn’t identify the Iranian ship involved in this case, but did say it was 1,000 meters away from the USS Mahan, which isn’t hugely close. According to the report, FSA members sold or handed over 8 armoured vehicles to ISIS. 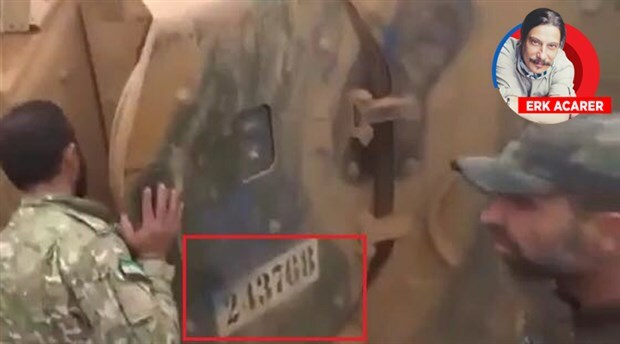 These vehicles had been delivered to the FSA by Turkey for the military operation in al-Bab. US media reports this week blamed North Korea for having a dastardly role in an alleged chemical weapons massacre in Syria.USA Today claimed: “The horrors of the civil war in Syria have proved a blessing for North Korea. The regime of Kim Jong-un has made a killing from selling arms and ammunition to the regime of fellow dictator, Bashar Assad.” It goes on to cite claims that a “key supplier” of Syria’s chemical weapons arsenal is the northeast Asian nation.